Russian Orientalist and historian; born at Novogrudok, government of Minsk, Oct. 27, 1839. His father, Jacob Harkavy, was a wealthy merchant and a prominent Talmudic scholar, connected by descent with the Jaffe family. At the age of fifteen Harkavy was sent to the yeshibah of Volozhin; and on the completion of his course there he took up secular studies, including German and French. In 1858 he entered the rabbinical school of Wilna; in 1863 the University of St. Petersburg, where he studied Oriental languages, and from which he graduated with the degree of master of history (1868), his graduating thesis being "Skazaniya Mussulmanskikh Pisatelei o Slavyanakh i Russkikh" (St. Petersburg, 1870). This work presents a collection of narratives by Mohammedan writers upon the Slavs and Russians. Harkavy was then sent abroad by the university to qualify for the chair of Semitic history; he continued his studies at Berlin under Rödiger and Dümichen, and in Paris under Oppert (1868-70); but in consequence of a misunderstanding with one of the faculty his appointment was not approved. 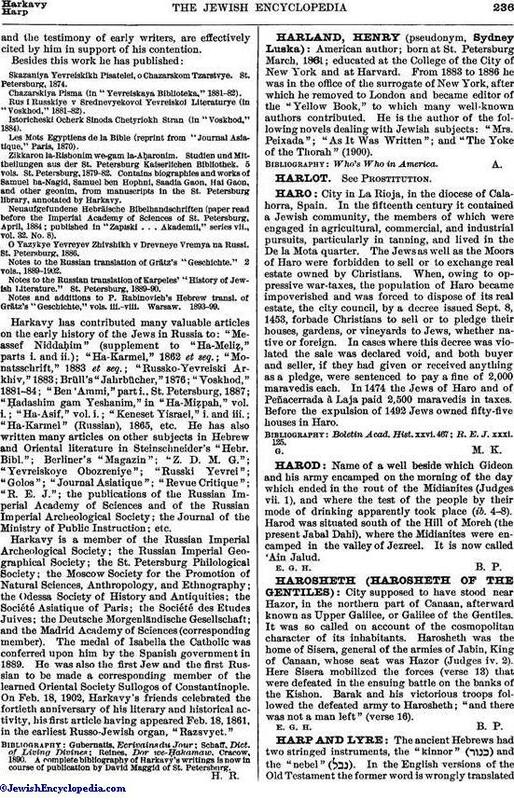 In 1872 Harkavy graduated as doctor of history, his thesis being "O Pervonachalnom Obitalishchye Semitov," etc., a study of the origins of the Semites, Aryans, and Hamites (ib. 1872). In the previous year he had published "Ob Istoricheskom Znachenii," etc., an essay on the importance of the Moabite inscription. After graduation he was attached to the Ministry of Public Instruction. This date marks the beginning of his work on the Hebrew and Arabic manuscripts in the Imperial Public Library of St. Petersburg, where he devoted himself particularly to the critical examination of the Firkovich manuscripts. In 1877 Harkavy received the appointment of librarian, which office he still (1903) occupies. Since 1873 he has been repeatedly sent abroad in the interest of historical and archeological research—to examine Biblical manuscripts (1873), as delegate to the congress of Orientalists (1877), to examine Palestinian and other Oriental monuments (1886). For his achievements in historical research the orders of Saint Stanislas (3d and 2d degrees) and Saint Anne have been conferred upon him by the Russian government, and he has also been raised to the rank of councilor of state. The labors of Harkavy have continued unremittingly for a period of more than forty years, and have opened up the field of early Russo-Jewish history. He has made accessible extensive collections hitherto but little known, and has thereby shed new light on obscure periods in Russian as well as Russo-Jewish history. His methods are best illustrated by his treatises on the Jewish history of southern Russia, the Caucasus, the Crimea, Chazaria, and ancient Kiev. Not a little of his time has been devoted to investigations in the history of the Polish-Lithuanian Jews and of the Karäites, and he deserves great credit for his exposure of Firkovich's falsifications. Apart from his work as a historian, he has rendered important services to the Jews of Russia by participation in their communal life. Beginning in 1864, Harkavy acted for a number of years as secretary of the Society for the Promotion of Culture Among the Jews of Russia, and since 1873 he has been one of the directors of the Jewish community of St. Petersburg. Among his numerous works in Russian, Hebrew, German, and French, there should be mentioned his "Ha-Yehudim u-Sefat ha-Slawim," studies in the early history of the Jews of Russia, first published in Russian by the Imperial Russian Archeological Society under the title "Ob Yazykye Yevreyev," etc. (St. Petersburg, 1865). Harkavy's aim here was to prove that the first Jews who settled in South Russia did not come from Germany, as was supposed by Grätz and other historians, but from Greece through the Black Sea region and the Crimea, and from the Orient by way of the Caucasus. He furthermore showed that Slavonic was the language spoken by the Jews in the Slavonic countries until the arrival of German Jews in great numbers during the Crusades. He proved that the Jewish writers in Russia and other Slavonic countries used Slavonic words and phrases in their Biblical and Talmudic commentaries. The Slavonic names among the Slavonic Jews, the Slavonic inscriptions in Hebrew characters on Polish coins, the tradition among the Russian Jews that their ancestors spoke Slavonic,and the testimony of early writers, are effectively cited by him in support of his contention. Skazaniya Yevreiskikh Pisatelei, o Chazarskom Tzarstvye. St. Petersburg, 1874. Chazarskiya Pisma (in "Yevreiskaya Biblioteka," 1881-82). Rus i Russkiye v Srednevyekovoi Yevreiskoi Literaturye (in "Voskhod," 1881-82). Istoricheski Ocherk Sinoda Chetyriokh Stran (in "Voskhod," 1884). Les Mots Egyptiens de la Bible (reprint from "Journal Asiatique," Paris, 1870). Zikkaron la-Rishonim we-gam la-Aḥaronim. Studien und Mittheilungen aus der St. Petersburg Kaiserlichen Bibliothek. 5 vols. St. Petersburg, 1879-82. Contains biographies and works of Samuel ha-Nagid, Samuel ben Hophni, Saadia Gaon, Hai Gaon, and other geonim, from manuscripts in the St. Petersburg library, annotated by Harkavy. Neuaufgefundene Hebräische Bibelhandschriften (paper read before the Imperial Academy of Sciences of St. Petersburg, April, 1884; published in "Zapiski . . . Akademii," series vii., vol. 32, No. 8). O Yazykye Yevreyev Zhivshikh v Drevneye Vremya na Russi. St. Petersburg. 1886. Notes to the Russian translation of Grätz's "Geschichte." 2 vols., 1889-1902. Notes to the Russian translation of Karpeles' "History of Jewish Literature." St. Petersburg, 1889-90. Notes and additions to P. Rabinovich's Hebrew transl. of Grätz's "Geschichte," vols. iii.-viii. Warsaw. 1893-99. Harkavy has contributed many valuable articles on the early history of the Jews in Russia to: "Meassef Niddaḥim" (supplement to "Ha-Meliẓ," parts i. and ii. ); "Ha-Karmel," 1862 et seq. ; "Monatsschrift," 1883 et seq. ; "Russko-Yevreiski Arkhiv," 1883; Brüll's "Jahrbücher," 1876; "Voskhod," 1881-84; "Ben 'Ammi," part i., St. Petersburg, 1887; "Ḥadashim gam Yeshanim," in "Ha-Miẓpah," vol. i.; "Ha-Asif," vol.i. ; "Keneset Yisrael," i. and iii. ; "Ha-Karmel" (Russian), 1865, etc. He has also written many articles on other subjects in Hebrew and Oriental literature in Steinschneider's "Hebr. Bibl. "; Berliner's "Magazin"; "Z. D. M. G."; "Yevreiskoye Obozreniye"; "Russki Yevrei"; "Golos"; "Journal Asiatique"; "Revue Critique"; "R. E. J. "; the publications of the Russian Imperial Academy of Sciences and of the Russian Imperial Archeological Society; the Journal of the Ministry of Public Instruction; etc. 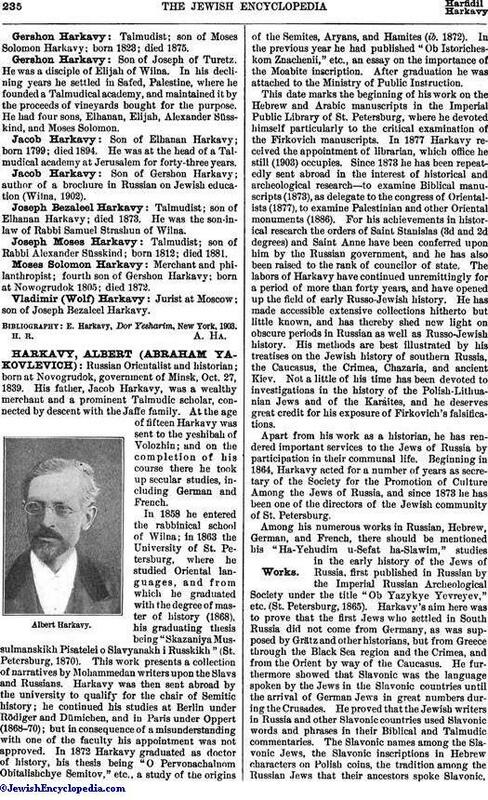 Harkavy is a member of the Russian Imperial Archeological Society; the Russian Imperial Geographical Society; the St. Petersburg Philological Society; the Moscow Society for the Promotion of Natural Sciences, Anthropology, and Ethnography; the Odessa Society of History and Antiquities; the Société Asiatique of Paris; the Société des Etudes Juives; the Deutsche Morgenländische Gesellschaft; and the Madrid Academy of Sciences (corresponding member). The medal of Isabella the Catholic was conferred upon him by the Spanish government in 1889. He was also the first Jew and the first Russian to be made a corresponding member of the learned Oriental Society Sullogos of Constantinople. On Feb. 18, 1902, Harkavy's friends celebrated the fortieth anniversary of his literary and historical activity, his first article having appeared Feb. 18, 1861, in the earliest Russo-Jewish organ, "Razsvyet." Reines, Dor we-Ḥakamaw, Cracow, 1890. A complete bibliography of Harkavy's writings is now in course of publication by David Maggid of St. Petersburg.